January 2014: Book Signing & Presentation by Kate Salley Palmer, Author of "First South Carolinians"
A native of Orangeburg, South Carolina, Kate Salley Palmer started her career while at the University of South Carolina, where she was the cartoonist for the student newspaper, The Gamecock. After graduating from USC with a degree in elementary education, Kate took a position as an artist at Clemson University. There she met her husband and co-author, Jim. After that period Kate published many cartoons for various national newspapers including the New York Times and The Washington Post, winning many awards along the journey. In 1991 Kate illustrated her first picture book, How Many Feet in the Bed for Simon and Schuster. Later that same year, Simon and Schuster published A Gracious Plenty, a book Kate wrote and illustrated about her great-aunt May Zeigler in Orangeburg. In 1998, Kate and Jim founded Warbranch Press, Inc. to publish and sell Kate’s books. In 2004, frustrated that many of the children she spoke to in her school visits were unfamiliar with the story of the palmetto tree and its importance to our state’s history, Kate wrote and illustrated Palmetto – Symbol of Courage. Kate has since written several books illustrating other events and characters prominent in SC history, most notably Francis Marion and the Legend of the Swamp Fox (2005). 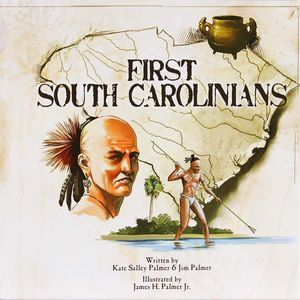 Kate’s most recent book, co-authored by Jim, and illustrated by James Palmer, Jr., is entitled First South Carolinians and was released in May, 2013. This book 'fills a huge void' about the Native Americans of South Carolina, and has achieved many good reviews from teachers, book sellers and others interested in our state's history.